IIIT Nuzvid Admissions 2018: Rajiv Gandhi University of Knowledge Technologies (RGUKT) has invited online applications for Admissions to 6-Year Integrated B.Tech Programme. Eligible Students Can Apply Online For RGUKT UG Admissions 2018 at http://rguktn.ac.in. » Andhra Pradesh and Telangana students can apply through APOnline services OR can use the links provided below. » Students belonging to States other than Andhra Pradesh & Telangana State including the children of Indians working in Gulf Countries / International and NRI students, please visit the Other States & International Students tab given above. » Read all information given in the Detailed Notification, Annexures and instructions given below carefully before applying. » Please carry study certificates from 4th class to 10th class and soft copy of your passport size photograph to APOnline Center for filling application. » An additional amount of Rs. 25.00 per application should be paid as service charges to the APOnline Centre. » The application fee can be paid in cash at APOnline service center, for which the center will issue a receipt. OR The application fee can be paid using the payment gateway link given above. » Please keep the application printout and payment receipt with you for reference. » Only PH/CAP/NCC/Sports applicants have to post their applications along with the relevant certificates to the specified address in the detailed notification. Sir, I am c. Jyothsna, I got 9.8 GPA in 10 class. But I don't get the iiit seat. My cast was BcB. 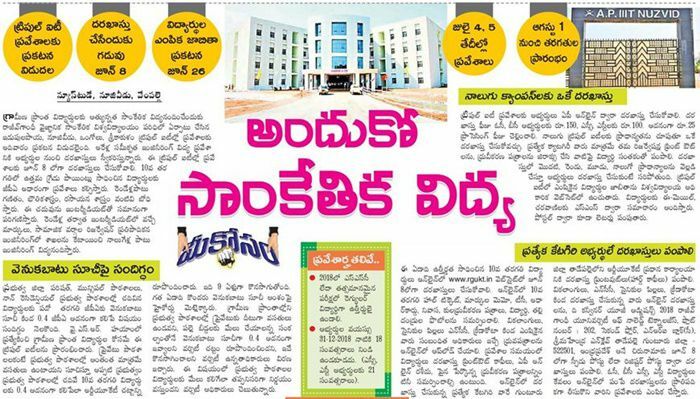 I studied at zphs girls in bukkapatnam. Sir ln our mandal only four members are selected. So, please give me a chance for me in second phase.